One of the joys of blogging is discovering events that test your limits and move you out of your comfort zone. One such event is the monthly Bread Baking Day, hosted this month by Temperance at High on the Hog. Her request was simple - bake a bread that is made with or served with cheese. I resisted the temptation to do a pizza. I love pizza but I wanted to expand my repertoire and do something really new. My search led me to a remarkable German bread that is made with and topped with Muenster cheese. The bread has a remarkable crumb, gorgeous color and a soft, yet crunchy, crust that is not to be believed. The bread stays fresh for several days but that gorgeous crust is best the day the bread is made. You'll need no special equipment to make these loaves but you might want to consider cutting the recipe in half as it produces two huge - monster Muenster - loaves. This bread was originally made with a German Munster which is much sharper than the American Muenster cheese used here. I've tried it both ways and prefer the milder Muenster. I do hope you'll try this bread - it is really, really good. I'm also sending this on to Susan at Yeast Spotting. 1) Combine 1-1/2 cups flour, yeast, sugar, and salt in the bowl of an electric stand mixer. Combine yogurt, butter and water in a microwavable bowl. Cook on HIGH power until butter melts, about 1 minute. Cool slightly. Slowly add to dry ingredients; beat for 2 minutes at medium speed. Add 6 eggs, 1/2 cup cheese and 1 cup flour; beat for 2 minutes at high speed. Add as much flour as needed to make a stiff dough (I used a total of 6-1/2 cups flour). Turn onto a floured surface and knead until dough is smooth and elastic, about 8 to 10 minutes. Your monster Munster bread looks wonderful! Love the cheesy crust! Thanks, Elle. This is really a nice bread. I hope you'll try it. Cheesy bread! It looks so scrumptious! Now this is my kind of bread, I love Muenster!! Is there anything more satisfying than the smell of baking bread? Love the cheese topping. This would be sooo good with a steamy bowl of soup. 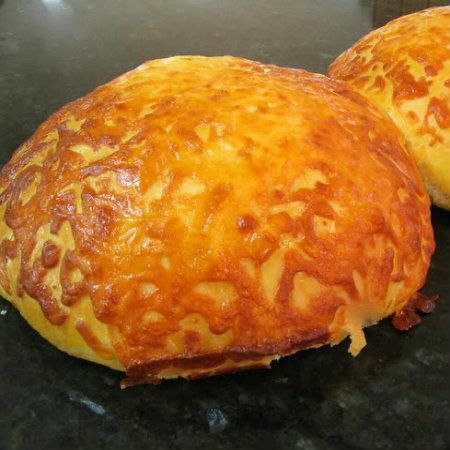 This looks so good, I love cheese bread. I never think to buy muenster, I need to fix that! Oh my, the cheese topping is cheezy good. These would be great as little bite-sized rolls too! Peter, that really is a great idea. Oh Mary, this looks amazing! I love the cheese crust. Folks, thanks for the compliments. I rarely jump up and down about a recipe but this bread is exceptional the first day it's made. With soup or stew it makes a wonderful meal. Oh don't cut it in half, share with me please! That's really lovely. That is phenomenal. I'd love a piece! I love this because I love Meunster Cheese. I'm sure it's delicious and it's beautiful! This sounds great! I love muenster cheese. I also just got a KitchenAid stand mixer and have been dying to make bread - this might be my first one! Do try this one, Maris. You will not be disappointed. Thanks for visiting us. I hope you'll come often. I really like the taste of Muenster (well, American Muenster - haven't tried German Muenster yet). This bread looks fabulous, especially the topping! Hi Jackie, thanks for stopping by. I hope you'll come back often. So true about stretching out of your comfort zone. These cheesy loaves look like just the perfect winter soup go-with. Muenster is so creamy and delicious. I bet it made a wonderful topping to such a nice soft looking bread. Gosh, your bread looks so delicious, so tempting. This bread looks amazing. Really, really amazing. Voila: www.tastingtoeternity.com. This book is a poetic view of 30 of the best loved French cheeses with an additional two odes to cheese. Recipes, wine pairing, three short stories and an educational section complete the book. I just took this marvelous bread from the oven. We couldn't wait to taste it so cut a piece. Yummy! The texture is awesome. Makes a beautiful loaf of bread. Great for entertaining. Anonymous, this is one of my favorite breads. I'm so glad you like it. Spread the word :-).